A huge amount of the Library’s information is now made available online, e.g. electronic journals, e-books and databases. OpenAthens is an access management system used by some UK universities for controlling access to these type of online services. Authenticating to OpenAthens enables you to access many of the Library's online databases, electronic journals and e-books seamlessly and without further challenge for usernames & passwords. Access to the Library's online resouces via OpenAthens is restricted to staff and students of the University. When accessing an OpenAthens resource for the first time, you may be faced with a generic OpenAthens login screen (see below). If so, you must search using the 'Find your organisation' box on the right in order to navigate to the correct Ulster login page. A search for Ulster will present a list that includes an Ulster University link. 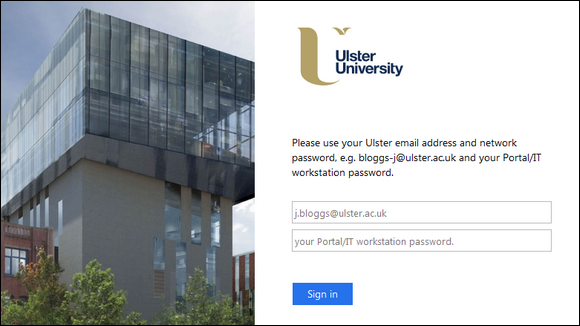 Clicking the link will take you to an Ulster sign-in page that will accept your institutional email address and network password to login (the same password as the Portal, IT workstations). Logging in successfully here will take you to the desired e-resource. Once logged in, you will remain authenticated throughout your browser session and shouldn't be challenged to login again if you visit other OpenAthens resources. In many cases, links from the Library Databases page will pre-identify you as an Ulster user and will pass you directly to the Ulster branded sign-in page and on to the desired resource after successful login. A successful login from the Ulster sign-in page will keep you authenticated during your browser session, preventing further login challenges from other OpenAthens resources. All users must adhere to Terms and Conditions of use with regard the Library's e-resources. Please remember, you must not divulge your usernames and passwords to anyone and that use of the Library's e-resources for commercial benefit is strictly prohibited. Some services do not permit off-campus use. Check the Databases page for details.